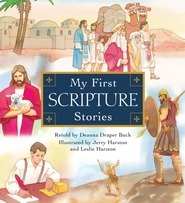 Perfect book for young ones to learn and visualize the scriptures. This book takes me back to when I was younger and Where's Waldo was all the rage! When my daughters were younger, we loved looking at Seek and Find books together. I love that this is a Book of Mormon centered book that teaches kids about the scriptures and helps visualize them too. I enjoyed how the pages are in order of the Book of Mormon, even the introduction and witnesses. Then gives an introduction to each book of scripture and activities that go with each. Very fun! The illustrations are perfect too. I know that my 10 year old will enjoy reading this book as we wait for church to begin. I received a PDF from the publisher in exchange for an honest review. I have enjoyed doing seek and find books with my children since they were young and we still pull one out from time to time. We looked at this together one day and had lots of fun! The pictures were easy to find and we enjoyed reviewing some of the stories. I've seen this illustrator's work before and knew we would have fun looking at some of the other pictures in each scene. We laughed at the pig walking a pig, the cat chasing the turtle and the turtle race (we have a Russian tortoise so pictures of turtles always get our attention). When we got to the end, it was fun to see that the author listed more items to seek and find for each page which include some of those fun pictures we found as we looked through the book. This would be a fun addition to a Sunday church bag! Little ones will need help reading the items to find but each page has a lot going on so just looking at the pictures should keep their attention for a while, too. It will also keep the attention of older children and they'll review scripture stories (whether they realize it or not). He also gives scripture references that they can look up to get even more out of it. This is a book that can be tailored to use for multiple ages in a variety of ways! I liked that this book starts at the beginning of the Book of Mormon and works through each book. The first page is an introduction that explains what the introduction of the Book of Mormon is and then it gives five things for the reader to find. The next scene takes us to the First Book of Nephi. A recap of the book is given and then a list of things to find is given. Each item is correlated with a scripture of where that item is found. For example: The tree of life--1 Nephi 8:10. The pictures are fun and silly and there is a lot to take in and notice. At the very end of the book, a list of more items to seek and find for each scene is given. 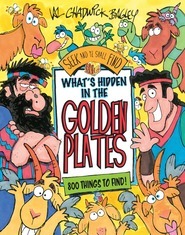 This is a fun book that will really help a child think about what is going on in the scriptures. This is a nice seek & find with Book of Mormon scenes and items found in the scriptures. I really liked the art work. some were funny, some were unique and even has the scriptures where the items were found. Even tells a little about what the scenes were. This would be a good book for keeping kids quite while they look for the hidden objects. I had fun looking for the items in the pictures. thirty two pages of fun with looking for the scriptures. I was given this ebook to read by Cedar Fort Publishing. In return I agreed to give a honest review and be part of Seek & Find Book of Mormon Stories blog tour.